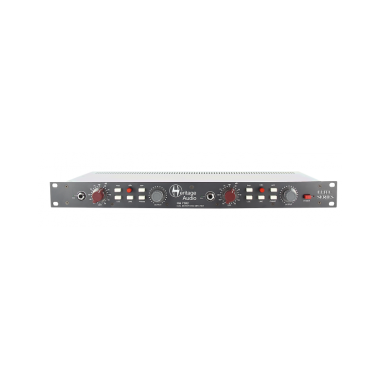 The HA73X2 Elite dual channel microphone preamp is made to the same specifications as the acclaimed ´73JR and DMA73 Heritage Audio models at a price never heard before. It is the exact equivalent to getting two HA73 Elite channels. 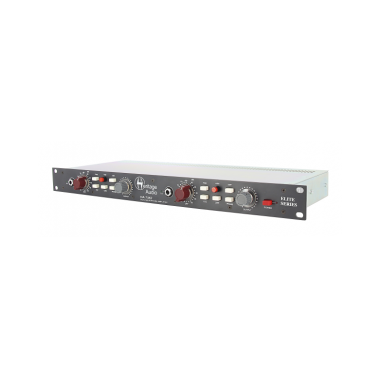 Manufactured in the same Spanish facilities as the rest of the HA line of products, the rack mountable HA73X2 Elite presents the classic recording preamp that, for generations, has been regarded for its rich, musical qualities and its ability to dramatically improve the sound of almost any source. Further, it includes the same exact great sounding JFET DI circuit found in the ´73JR and a fully discrete class A high pass filter. With 80 dB of available gain and dedicated mic, line, and instrument inputs; the HA73X2 Elite has everything you need to bring microphones and instruments to life with vintage vibe and thickness. The HA73X2 Elite features gain, output trim, -20db pad, polarity reverse, a high pass filter, and +48v phantom power. It comes housed in a rugged 1RU British steel chassis and utilizes an external power supply for low noise operation. The HA73 features Carnhill input and output transformers, high quality pots and switches, and best of all is 100% made by Heritage Audio. Frequency response :20Hz (+0.3dB) to 20Khz (-0.2dB). Power consumption: Less than 260 mA @48VDC.